The number of people over 65 in the U.S. will more than double in roughly the first quarter of this century. Many of these elderly would prefer to maintain their independence and remain in their homes. Additionally, many suffer from depression. 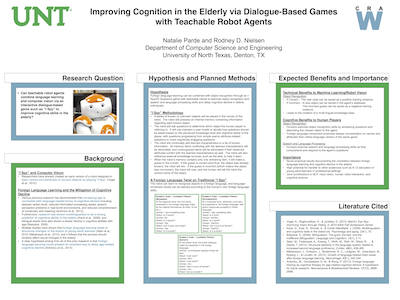 We are researching means of supporting these seniors via emotive spoken-dialogue companion robots (Companionbots; Nielsen PI, NSF $1.96M total 2011-2015; UNT, CU, DU, UCD Anschutz Medical Campus, and Boulder Language Technologies). 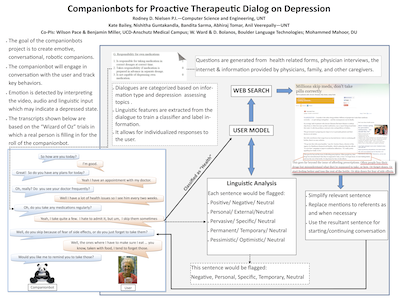 The focus of the research is on dialoguing, especially generating and answering questions, in the context of providing education and training related to depression, monitoring participants for signs of physical, mental or emotional deterioration, and being a companion. NLP will capitalize on multimodal input and output, be heavily context dependent and tightly integrated with a user model and history. ML will emphasize co-training on multimodal input and user-assisted semi-supervised learning from massive data sets and data streams. 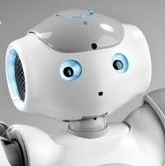 Future work will include massive-scale data mining over the information collected by the Companionbots. 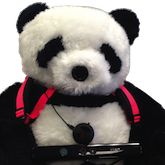 Banlu, (Chinese for Companion), was the first companionbot to join the HiLT Lab. She is a custom built companionbot. We will post more info on Banlu as the project continues. Grace, a Nao Robot, joined the HiLT lab this semester. We will post more info on Grace as the project continues. Grace has a twitter account (@GraceHilt) where you can follow the latest details of her activity in the HiLT lab. 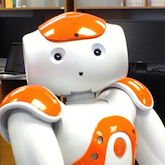 Bobby, a Nao Robot, joined the HiLT lab this semester. We will post more info on Bobby as the project continues. Bobby has a twitter account (@BobbyHilt) where you can follow the latest details of his activity in the HiLT lab.